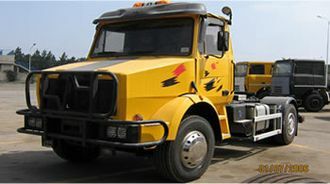 A beam axle, rigid axle or solid axle is a dependent suspension design, in which a set of wheels is connected laterally by a single beam or shaft. 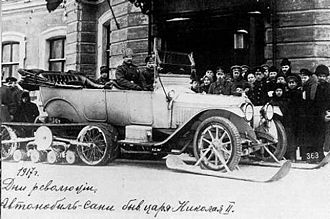 Beam axles were once commonly used at the rear wheels of a vehicle, but historically they have also been used as front axles in rear-wheel-drive vehicles. In most automobiles, beam axles have been replaced by front and rear independent suspensions. 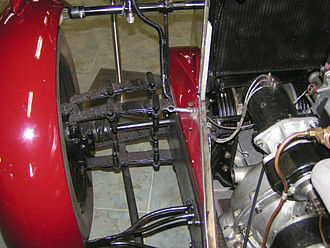 With a beam axle the camber angle between the wheels is the same no matter where it is in the travel of the suspension. 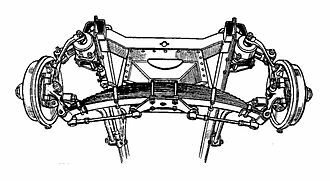 A beam axle's fore & aft location is constrained by either: trailing arms, semi-trailing arms, radius rods, or leaf springs. 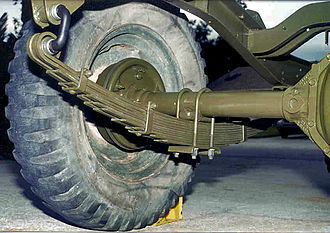 The lateral location can be constrained by a Panhard rod, a Scott Russell linkage or a Watt's linkage, or some other arrangement, most commonly by the leaf springs. Shock absorbers and either leaf springs, coil springs, or air bags are used to control vertical movement. 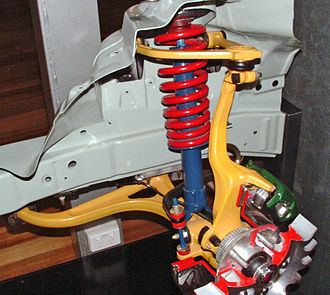 The Twist-beam rear suspension is a similar suspension design, however its beam axle is able to twist thereby functioning as an anti-roll bar to control the roll motion of the body and is considered to be a semi-independent suspension design. 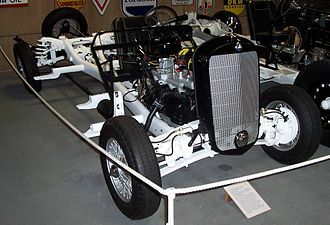 A live axle is a type of beam axle in which the shaft (or, commonly, shafts connected to move as a single unit) also transmits power to the wheels; a beam axle that does not also transmit power is sometimes called a dead axle. While typically used in vehicles with Hotchkiss drive, this suspension system can also be used with other types of power transmission. The principal advantage of the beam axle is its simplicity. This simplicity makes it very space-efficient and relatively cheap to manufacture. They are nearly universally used in buses and heavy-duty trucks. Most light and medium duty pickup trucks, SUVs, and vans also use a beam axle, at least in the rear. Beam axles have an important advantage for off-road applications, as they provide better vehicle articulation and durability in a high load environment. The drawbacks are that it does not allow each wheel to move independently in response to bumps, and the mass of the beam is part of the unsprung weight of the vehicle, which can further reduce ride quality. Also the cornering ability is typically worse than other suspension designs because the wheels have zero camber angle gain during body roll. Front beam axle suspension is also unusually sensitive to any lack of concentricity in the hub and wheel assembly which can cause a side-to-side oscillation ("shimmy") of the steering at certain speeds (typically 40-50 mph). This is addressed on some vehicles with steering dampers although removal and careful refitting of the front wheels often cures the problem. In the automobile industry, weight transfer customarily refers to the change in load borne by different wheels during acceleration. This article uses this latter pair of definitions, in wheeled vehicles, load transfer is the measurable change of load borne by different wheels during acceleration. No motion of the center of mass relative to the wheels is necessary, load transfer is a crucial concept in understanding vehicle dynamics. The same is true in bikes, though only longitudinally, the major forces that accelerate a vehicle occur at the tires contact patches. It is these moments that cause variation in the load distributed between the tires, often this is interpreted by the casual observer as a pitching or rolling motion of the vehicles body. A perfectly rigid vehicle without suspension that would not exhibit pitching or rolling of the body still undergoes load transfer. e, contact patch displacement relative to wheel. Lowering the CoM towards the ground is one method of reducing load transfer, as a result load transfer is reduced in both the longitudinal and lateral directions. Another method of reducing load transfer is by increasing the wheel spacings, increasing the vehicles wheelbase reduces longitudinal load transfer while increasing the vehicles track reduces lateral load transfer. Most high performance automobiles are designed to sit as low as possible and usually have an extended wheelbase, weight transfer occurs as the vehicles CoM shifts during automotive maneuvers. Acceleration causes the mass to rotate about a geometric axis resulting in relocation of the CoM. Liquids, such as fuel, readily flow within their containers, as fuel is consumed, not only does the position of the CoM change, but the total weight of the vehicle is reduced. By way of example, when a vehicle accelerates, a weight transfer toward the wheels can occur. An outside observer might witness this as the vehicle visibly leans to the back, under braking, weight transfer toward the front of the car can occur. Under hard braking it might be visible even from inside the vehicle as the nose dives toward the ground. 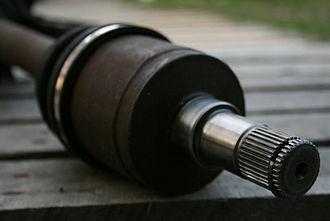 An axle is a central shaft for a rotating wheel or gear. 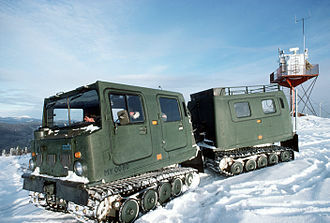 On wheeled vehicles, the axle may be fixed to the wheels, rotating them, or fixed to the vehicle. In the former case, bearings or bushings are provided at the points where the axle is supported. In the latter case, a bearing or bushing sits inside a hole in the wheel to allow the wheel or gear to rotate around the axle. Sometimes, especially on bicycles, the latter type axle is referred to as a spindle, on cars and trucks, several senses of the word axle occur in casual usage, referring to the shaft itself, its housing, or simply any transverse pair of wheels. Strictly speaking, a shaft which rotates with the wheel, being either bolted or splined in fixed relation to it, is called an axle or axle shaft, however, in looser usage an entire assembly including the surrounding axle housing is called an axle. An even broader sense of the word refers to every pair of wheels on opposite sides of the vehicle, regardless of their mechanical connection to each other. 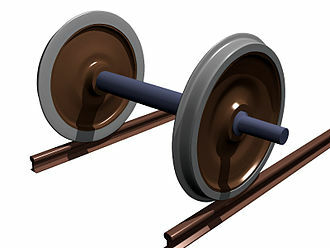 Thus, transverse pairs of wheels in an independent suspension may be called an axle in some contexts, axles are an integral component of most practical wheeled vehicles. In a live-axle suspension system, the serve to transmit driving torque to the wheel, as well as to maintain the position of the wheels relative to each other. 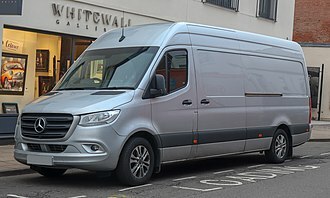 The axles in this system must bear the weight of the vehicle plus any cargo. A non-driving axle, such as the front beam axle in heavy duty trucks and some 2-wheel drive light trucks and vans, will have no shaft, many front wheel drive cars have a solid rear beam axle. In other types of systems, the axles serve only to transmit driving torque to the wheels. This is typical of the independent suspension found on most newer cars and SUVs and these systems still have a differential, but it will not have attached axle housing tubes. It may be attached to the frame or body, or integral in a transaxle. The axle shafts transmit driving torque to the wheels, like a full floating axle system, the drive shafts in a front wheel drive independent suspension system do not support any vehicle weight. 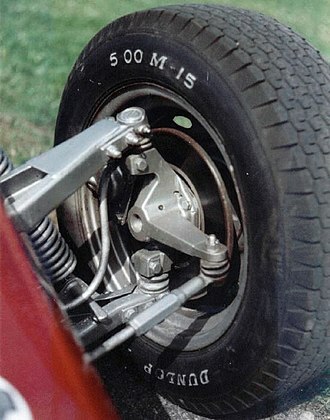 A straight axle is a rigid shaft connecting a wheel on the left side of the vehicle to a wheel on the right side. The two generations overlap in time due to their being used in both full size and sports models that were updated at different times. The X-Type has two versions of IRS based on the Ford Mondeo estate system, depending on whether front or 4-wheel drive. When first introduced, it was rare for British cars to have independently sprung rear wheels. The reduction in transfer of vertical undulations in road surface to the body provides a smoother ride. Jaguars first IRS system took five years to develop, a Mark 2 saloon fitted with a prototype IRS demonstrated a reduction in unsprung weight of 190 lb compared with a live axle. Its first production application was in the E-Type from its launch in 1961, the assembly was manufactured in three different sizes with differing track widths to suit different models. The first generation Jaguar IRS continued to be updated and used until production of the XJS ended in 1996, the IRS is built around a fabricated steel crossbeam that allows it to be relatively easily removed from the vehicle as a complete assembly. This feature has made it suitable for adaptation as a component on other vehicles. The complete rear suspension assembly is carried in a steel crossbeam, the rear wheels are located transversely by top links and wheel carriers and lower links. The top link is the driving half-shaft with a joint at each end. The lower link pivots adjacent to the casing at its inboard end. The pivot bearings at each end of the link are widely spaced so as to provide maximum longitudinal rigidity. Suspension is provided by two coil spring and damper units on each side of the casing, the spring and damper units attaching to the crossbeam at the top. The crossbeam is located by two radius arms each of which runs forward from the link to a point on the vehicle body and is pivoted at each end via rubber bushings. The only other points of contact with the body are by means of metal sleeved rubber bushes. The fabricated steel crossbeam carries the differential and inboard brakes, the differential is a Salisbury 4HU unit with a hypoid spiral bevel gear. First generation Jaguar IRS unit. It is sitting far higher than it would mounted in the car, as it is not sprung with the car's rear mass. The side struts sit about horizontally in the live installation. Camaro performing a wheelie during drag racing. A motorcyclist performing a stoppie. A Toyota MR2 leaning to the outside of a turn.